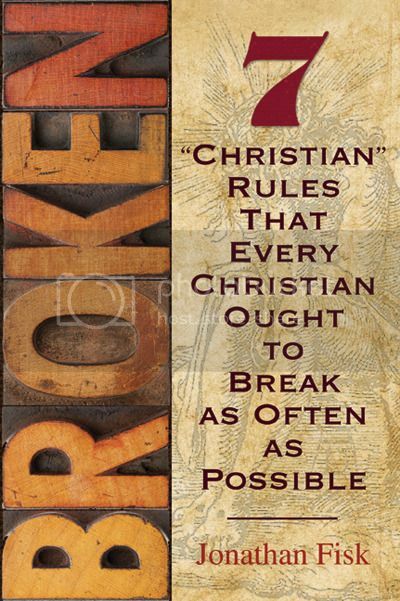 I bought and quickly read from cover to cover Broken: 7 "Christian" Rules That Every Christian Ought To Break As Often As Possible by Rev. Jonathan Fisk back in September 2013 soon after I fully embraced my escape from American Evangelicalism and some Reformed types and became a Confessional Lutheran by the sole grace of God. By "soon after" I mean I was only about 1 month removed from my spiritually dangerous past at the time. In addition, I was just beginning an unexpected month long Bible study, debate, and discussion with a dear friend about how we should not move forward with a planned 6-week Small Group Series at our church based around Francis Chan's bestselling book titled Crazy Love, because it was un-Biblical, certainly anti-Lutheran, and it would be irresponsible of us given what we knew about the message it proclaims as "truth" from God's Word. In short, the juxtaposition of the two books couldn't be more revealing. Broken is the antithesis of Crazy Love. The former is Biblical (and distinctly Lutheran I might add) and the latter is anything but! After reading the first couple of chapters, and discovering a FREE Discussion Guide available online, I even made the bold decision to push for us to make a last minute change and build the 6-week Small Group Series around this book instead, that's how comforted and inspired I was by this book written by a Pastor that seemed to "get it" and who could clearly communicate everything I was struggling with myself at the time. Unfortunately, my persistent pleas fell on deaf ears though. My church made the crazy decision to move forward with Chan's Crazy Love...even though they thought they had compromised with me by ripping out a handful of pages from each copy before distributing them to church members who were participating in the study. The 70 or so participants in the Crazy Love series got a heavy dose of the Law and ended up being deceived by Law, Morality, Pietism, and Works-Righteousness while I was blessed to receive both a truth serum injection and a proper distinction between Law and Gospel! Two years later, I'm saddened and sorry to say that relationships have been damaged or destroyed and this particular church has continued to stray from "the faith that was once for all delivered to the saints" (Jude 1:3) as found in both the Holy Bible and the Book of Concord, which everyone insists they believe and respect. The culprit? "Speaking the truth in love" (Ephesians 4:15). Needless to say, Pastor Fisk's writing in his was also "speaking the truth in love" (tough love!) too. I didn't reject it though, but prayerfully considered it's important message. As a result, this book was eye-opening for me, and I remember how I had repeatedly told my wife how I had wished I had read a book like this 10 years ago when I first began to consciously think about this faith that was given to me, because it should be required reading for any and all Christians, especially those who are new to the faith. Come to think of it, this would be an excellent book to have Confirmands read too. Given how much of an impact this book has had on pointing me to Jesus Christ, on pointing me to the cross, on pointing me back to my Baptism, on pointing me to the Scriptures, on simply clarifying what some well-known but completely misunderstood passages of the text really say and are teaching, on properly understanding the importance of the Lord's Sacraments, and on helping me to sort out my own confusion and uncertainty, I feel it's time to write a detailed Book Review. It's been 2 years since I finished reading it, but looking back I can see how it was definitely the best book for me to read back then based on what I was going through. In other words, it's sort of like a "User Manual For New Converts To Lutheranism" in some respects, especially when you consider how it helps in the "deprogramming" process as I was learning to unpack all this spiritual baggage I had carried with me over from the spiritual Non-Denominational island I had been living on for years up until that point. For me, I would like to revisit the book by writing a brief review for each chapter, which will follow this entry today. I know that could mean that this series might get a little long before all is said and done, but the book really is that good and this needs to be done, IMHO. I mean, it challenged me from the very first page, had me deeply examining myself (2 Corinthians 13:5), forced me to admit some things about my former beliefs, and even prompted me to engage in some meaningful conversations with loved ones as a result. Most importantly, it steered me back to the forgiving and loving arms of Jesus Christ and explained the importance of Word and Sacrament ministry, which I merely viewed as being mainly "symbolic" up to that point. Clearly, a book that succeeds at doing all of that is worth writing about. So, here goes! The first thing you notice about this book is the provocative title. At first, I'll admit that I was very suspicious. I've been down this road before with Evangelical authors and I know that controversy sells so it wasn't a stretch to think that he was just like all the others who was looking to make a quick buck more than he was concerned about feeding the Lord's sheep entrusted to his care. That suspicion was amplified a bit for me when I realized that he also had a video series that went along with this book (again, just like many of the popular Evangelical authors do). Naturally, I was applying my own presuppositions to all of this and that's why my defenses were up, especially after having just escaped American Evangelicalism. I'm happy to say that any suspicions I had were quickly laid to rest once I saw the promotional video for this book. Ok, that defnitely sounds like the type of book I would enjoy reading, but how is it any different from others on the market? Well, besides being written by a Lutheran Pastor, I found the description on the back of the book even more intriguing. Real Answers. Real Religion. Real Holy Spirituality. There are only two kinds of spirituality in the world. One is false, and one is true. One is the manifestation of the old evil foe who has sent many false spiritualities out into the world, and the other is the holy spirituality found only in faith in the one true God. One is a lie, and one is real. But which is which? Examine seven counterfeit "Christian" rules that every Christian ought to break as often as possible. They are teachings taught as if they were doctrine, but which are nothing more than the traditions of men. The dark secret of Christianity in America is that we are losing. We hide it with light shows, Christian dance and music and video games, but it's true. And it's not new. Fisk shows how, under the cross of Jesus, you will find that your mind, heart, and hands, your reason, emotions, and sense of mercy, are the very things that our Lord has redeemed. In the resurrection of Jesus, in His fulfillment of the Law, in the essence of His Gospel, in the pure Word of God, you will find the truth. Now I was paying attention! Sure, it still has a few common Christian buzz words that I was wary about (i.e., "true" and "false"), but there was enough here to pique my interest. One of the first things you notice about this book once you get past the title, the cover, the videos, and the Pastor (who, if you've never heard or seen him before, you might think is after obtaining a "rock star" status within Christ's Church) is the unique way in which the truth is presented on the pages within. This is not a quick read and you don't wan to rush through it either. There are 7 distinct "Rules" to discuss that are spread out over 277 pages and each one also contains unusual images that you wouldn't normally expect to find in a book pertaining to this kind of serious subject matter. However, those who are already familiar with Rev. Fisk's Worldview Everlasting videos will have no problem with these aesthetics since the book is like the videos in written form. Those who are new to Rev. Fisk and his YouTube Channel and online work might want to start there before they jump right into the book. I'm not suggesting that you judge the book based on the videos (especially if you don't like his style at first, which is what is likely to be the case for most based on the feedback I received from people I've shared this with in the past). I'm only suggesting that you start with the visuals to sort of get yourself acclimated to that approach before you pick up the book to start reading it. After all, the last thing you want to do is become distracted by style and the images anyway when they are secondary to the content and are only there to supplement it. This book and it's message is mainly concerned with substance, substance, substance. What I particularly admire about Rev. Fisk is his ability to put things into layman's terms too. He has a real gift for explaining complex doctrines and theological truths to regular people like me, or people like me who are new to the Lutheran confession of the faith. That was the first thing I noticed. The second thing I noticed was his willingness to be honest and transparent from the very first page. Fisk has no qualms about writing with a humility that allows him to be truthful about his own beliefs, experiences, and struggles from years ago, which lends credibility to what he is trying to communicate to his readers. To put it another way, he knows that what he's writing about is true for a lot of people because he was once a part of those "a lot of people" himself. That should also give you a glimpse of Rev. Fisk's penchant for diagnosing the problem. Better yet, he not only diagnoses the problems as they exist within the Christian Church today, but he offers the only Biblical solutions we need to address them. That is where this book really proves its value and worth. For instance, I found it refreshing that each and every chapter ends with a clear presentation of the Gospel of Jesus Christ, which I can' remember ever noticing in other "Christian" bestsellers. Some chapters even had the Gospel sprinkled in from start to finish with the ending being the exclamation point. My dear friends, take it from someone who is a voracious reader, and who has read all the Christian bestsellers from popular Evangelicals over the years -- you just don't get that in most Christian books. What you get is man's wisdom elevated over and above God's wisdom. Speaking of God's wisdom, it was a very wise decision to include in each chapter a Biblical definition or two of the popular words and phrases often heard and/or used by Christians today so that the reader can clearly see how what is often thought of and widely accepted as "Biblical and Christian truth" is actually far from it. In fact, Rev. Fisk even includes various sections where he devotes a few sentences to explaining certain doctrines as they apply to that chapter's focus. BOLD TYPE as well as Font Type are also used regularly to emphasize key truths and points that the author is trying to make. This is extremely helpful to the reader. Furthermore, I appreciated how Rev. Fisk did not back away from his identity in Christ as a Lutheran either. It was comforting to read about the importance of both the Word and the Sacraments (and the Divine Service/Liturgy too in some cases), which are emphasized as well. All in all, this is hands down one of the best Christian books I've ever read, and it's currently the one I am referring to others when they ask me if I know of any good Christian books they can or should read. Just always keep in mind that not everyone will like you for recommending this book. In all likelihood, you will probably hear from more people who are mad at you for suggesting they read it than you will from those who are forever grateful. That's just because the truth hurts (Ephesians 4:15; Proverbs 27:6) and there's so much truth presented in this one book that it's possible that many people might not even want to go beyond the very first chapter for fear of what it might reveal about themselves and their own beliefs at the moment. I will also say that everyone will find that somewhere in this book you will come to realize that you are reading about yourself. Exactly! Yes, that's spot on! It's precisely why every Christian needs to get a copy of this book and read it for themselves as soon as possible. I'd offer to lend you my copy, but my selfish heart knows it needs this book to refer to again and again. Besides, I'm not quite sure you'd be able to read it without getting distracted by all of my underlining and notes in the margins! If I'm looking for a criticism, then the only thing I could possibly come up with is to say that some readers might find his creative use of metaphors either annoying or over their head. Critical thinking and reading comprehension (a.k.a. reading things properly in context) being at the low level that they are these days, I think it's probably better for most people that they read through this book as part of a Pastor led study as opposed to just reading it on their own. Personally, I loved his approach myself, but I was also an English Major in college and love to read, and I know people who have said the portions they read were difficult for them to understand. In addition, while his main audience on the surface seems to be the younger, post-modern, emergent types, there are many different age groups who feel "broken" and who could greatly benefit from reading this book. I'm just not so sure that a lot of the Pop Culture references sprinkled throughout will make sense to those older generations, but I could be wrong about that. Still, all of that is simply me just intentionally looking for a negative thing to say about this book. Please note that none of these concerns have anything at all to do with the way Pastor Fisk exegetes Scripture or teaches doctrine. I am forever grateful for faithful men like Rev. Jonathan Fisk who write books like this with Galatians 1:6-10 in mind. Nowadays, more books like this are needed for sure! In a Lutheran layman's terms, get this book for yourself right away, and then ask your Pastor if he would kindly lead a study and discussion group on it. Jeffrey, have you read "A Strange Review: Broken" posted on April 8, 2013 by Anthony Sacramone? More of former evangelicals struggling to understand Lutheran doctrine and confessions. No, I don't believe I've seen that yet so thank you very much for sharing it here with all of us. I'll have to check that out later today for sure! Isn't that special! I tried to open the link to strangeherring.com and get the following error message: Warning! Domain mapping upgrade for this domain not found. Please log in and go to the Domains Upgrades page of your blog to use this domain. Got to love technology. Hi Jeff, I found "A Strange Review: Broken" posted on April 8, 2013 by Anthony Sacramone which had apparently been moved to: http://anthonysacramone.com/2013/04/08/a-strange-review-broken/#more-18300. See what you think! Here are to blog posts by Anthony Sacramone that provide a somewhat unique perspective on the LCMS and Jonathan Fisk's book, Broken.